Roger Leloup's tales of the adventures of Yoko Tsuno, a female Japanese electronics engineer, began in Spirou magazine in 1970 and while set in the modern day they can veer between full on science-fiction and more realistic straight adventure. 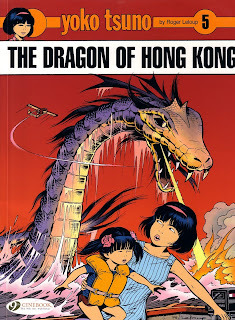 The Dragon Of Hong Kong, despite its title and cover, is one of the straight adventure stories. The 16th of the 24 Franco-Belgian Yoko Tsuno albums, this is the Cinebook's 5th Yoko Tsuno book and the first time that the story has been published in English. Yoko has travelled to Hong Kong to visit with Chinese relatives and while sailing in Victoria Harbour her junk is attacked by a lizard-like sea monster. Surviving the attack, Yoko sets about locating the huge lizard and discovers that an orphaned child, Morning Dew, has befriended it. Morning Dew lives with her frail grandfather who gives his permission for the child to go with Yoko to search for the lizard. During this search their boat is attacked by a different monster that breathes fire and nearly kills them. Morning Dew's grandfather tells Yoko that the two monsters were created to star in a film The Dragon Of Hong Kong which leads Yoko to a businessman with a surprising secret. 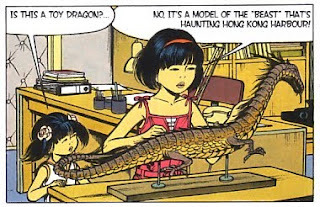 Yoko Tsuno is very much a adventure series for children with Yoko something of a Nancy Drew like character. 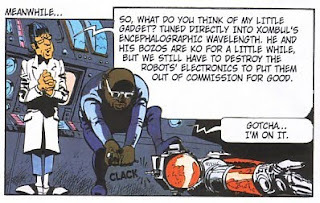 For this particular story, which ran in in Spirou between issues 2527 and 2536 in 1986, there is no great need for Yoko to have an electronics background. What she does have is a logical mind and a need to understand the unnatural beasts she comes across coupled with the desire to set things to rights. That also includes protecting Morning Dew from the deaths of those she loves which includes legally adopting the girl. Roger Leloup's story is decidedly upbeat with Yoko being a positive role model throughout whilst his artwork is effective on his monsters and accurate on his ships and planes. With the story nearly a quarter of a century old it takes place in British Hong Kong rather than Chinese Hong Kong but that is irrelevant to the plot and the only thing that noticeably dates it is when Yoko is taken to the computer room of a bank, with its tractor-feed printers, when she is trying to find the businessman. The reasons behind the creation of the two sea monsters are childishly effective, if somewhat far fetched for an adult, but I do like Leloup's concept of an oriental monster movie being shot on location with full size creatures rather than men in monster suits like the Toho Gojira/Godzilla movies, as impractical as it would be in reality. 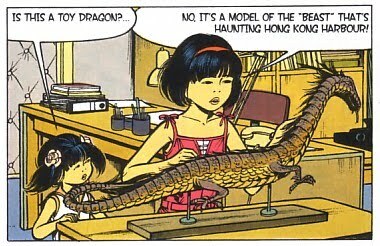 Yoko Tsuno - The Dragon Of Kong Kong is a well executed adventure story for children, perhaps of more interest to girls with the two female lead characters, but the two monsters should be more than enough the keep boys interested as well. This would certainly make a change from buying daughters and nieces manga books as birthday or Christmas presents. • There are more details of the English language Yoko Tsuno books on the Cinebook website. 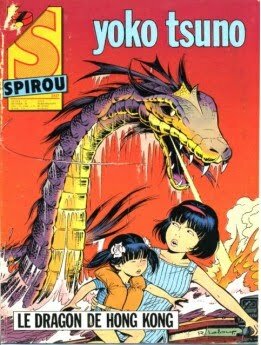 • There are more details of the French language Yoko Tsuno albums on the official Yoko Tsuno website (in French). (updated 1 Augsut 2010): Manchester Metropolitan University will play host to an academic conference on bande dessines next year - and the call is out for papers. The International Bande Dessinee Society and the peer-reviewed Journal of Graphic Novels and Comics and Intellect's Journal of Comics Studies are hosting a joint conference focusing mainly on two areas of research - Space and Time, and audiences and readership. The organisers say they also welcome submissions from other areas of research such as manga, African, Latin American, Asian, Eastern European comics; and the connections between comics and other media. Abstracts of approximately 250 words should be submitted in English (French is acceptable for articles submitted to the International Bande Dessinee Society) and sent to Matthew Screech (m.screechATmmu.ac.uk), a Senior Lecturer in French at the University, David Huxley (d.huxleyATmmu.ac.uk), comics writer and artist, Senior Lecturer in Film and Media Studies and joint editor of Routledge's Journal of Graphic Novels and Comics; and Joan Ormrod (j.ormrodATmmu.ac.uk), also a Senior Lecturer in Film and Media Studies, by 1st December 2010. Papers will be considered for publication in Journal of Graphic Novels and Comics and Liverpool University Press's European Comic Art. • The Joint International Conference of Graphic Novels, Bandes Dessinees and Comics will be held at Manchester Metropolitan University, Manchester. Graphic Novels and Comics will take place 5-6th July and the International Sande Dessinee Society event on 7th - 8th July 2011. British comics writer Antony Johnston will be on hand to help promote the new EA Games title Dead Space 2 when it's trailed at the next London MCM Expo, which will be held at Excel on 29-31 October 2010 and closes out the month-long London Games Festival. By then, his new Dead Space graphic novel, drawn by Christopher Shy and published by IDW, may also available - if not, check out the official Dead Space web sites. The Dead Space 2 game ramps up the horror action even further than the original, as lone survivor Isaac Clarke struggles to keep his sanity while taking on relentless necromorph onslaughts. EA say players will be kept on the edge of their seats as Isaac fights bigger, scarier and more epic battles than ever before aboard an all-new space installation known as ‘The Sprawl’. Having trailed the original Dead Space at London MCM Expo, Midlands MCM Expo and Memorabilia, the videogames publisher returns to offer show visitors an über early sneak peek of the much-anticipated sequel, set to hit shelves in January 2011. London MCM Expo is also delighted to announce that award-winning British author Antony Johnston, whose has written several Dead Space projects, will also be attending the show. His latest Dead Space story is Dead Space: Salvage, a self-contained 120-page graphic novel, billed as a “sidequel” and taking place between the first and second Dead Space games. It tells the story of the missing, necromorph-infested planet-cracker USG Ishimura, presumed lost and drifting somewhere in the Aegis system. Then the ship is discovered by a band of ‘magpies’ -- unlicensed miners and salvage merchants -- who quickly realise it’s not the bountiful haul they were hoping for. Anthony also wrote the Dead Space webisodes based on the saga and the Dead Space: Extraction comic and graphic novel. Christopher Shy, who is illustrating the new graphic novel, is the founder of Studio Ronin and an accomplished film and concept designer, whose graphic novel projects include Silent Leaves, Soul StealerAscend, Good Apollo, work for Marvel, DC, as well as set design for concerts, and film. Recently, Studio Ronin and Christopher Shy completed work on the graphic novel Pathfinder, released by Dark Horse Comics, which was made into a film directed by Marcus Nispel. Studio Ronin handled design on the film in almost every aspect, from simple sword and helmet designs, to miniatures, and customs concepts, as well as the promotional materials, including the international and domestic movie poster. British comics guru Dez Skinn is running an auction for a rare piece of Marvelman art by Garry Leach. On offer is Marvelman Episode 3, page 1 (which first appeared in Warrior Issue 3). "As an experiment, partially because of resenting the massive percentage eBay takes and partially because it's on behalf of a friend, this will be a public auction done through my Wall on Facebook, along with Paypal for the winner," says Dez. "Once in Facebook, enter "Dez Skinn" to view. The auction is now open and will finish on August 8th at 10.00pm (British Summer Time). "It's an experimental use of Facebook Events, so apologies in advance if you encounter any difficulties finding it," says Dez. "If you don't wish to join Facebook, email me directly for progress reports [via Dezskinn1ATyahoo.co.uk] and bidding information. Updates to all interested parties who ask for such will be sent out every few days." The opening bid for is £200. Those wacky Etherington Brothers - whose work includes strips for Titan's Transformers comic, The DFC and more - are offering a limited one week only 20% off deal on collections of their own creator-owned material, which are available via Print on Demand service Lulu.com. "You're gonna have to move fast to take advantage of this one," enthuses Robin Etherington. 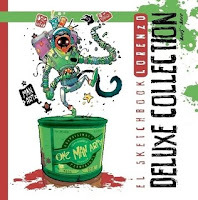 "We're offering you 20% off El sketchbook Lorenzo Deluxe collection and/or Malcolm Magic Big Kahuna Collection until 1st August 2010. "That's a massive £4.99 off the sketchbook alone! Just go here, choose the books you want and enter the code "TWIST" at checkout to make your lovely big saving! You're welcome!" The boys are clearly in a generous mood thanks to just signing a deal to produce a series of Etherington Brothers illustrated novel series - a project that has been in development for a while. "Like every creative endeavour, it has taken time to mould this project into the perfect vehicle to satisfy our comic and storytelling sensibilities," says Robin. "We set out to create a series that we'd have been desperate to read as young boys and our fantastic editor David Fickling has been instrumental throughout the process. It's an absolute delight to team up with David and Random House again and follow Monkey Nuts and Baggage with the first two titles from our forthcoming (ongoing) children's series. 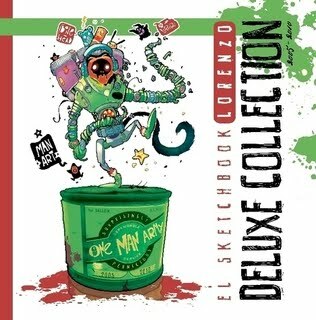 "The books be jam-packed with action and adventure," he enthuses, "and filled with page after page of illustrative wonder courtesy of Lorenzo's scribbling paw." The boys many fans need not worry that this new project means they have turned their back on the world of comics. "Not in the slightest!" says Robin. "This is an exciting undertaking for our little studio but the fun of sequential storytelling is in our blood. As such these books will contain more than their fare share of speech bubbles and comic panels!" Harvey Pekar, who died earlier this month. Next month will see an event celebrating the life of American cartoonist Harvey Pekar, who died earlier on 12th July. A joint Birkbeck Contemporary Fiction Seminar and International London Comics Grid Bootleg event, it will feature a short discussion of Pekar's life and work followed by a screening of the film American Splendor. 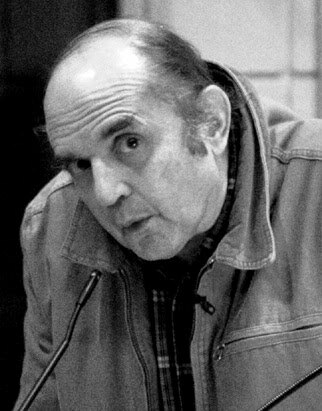 Comics writer and jazz fan Harvey Pekar first published his autobiographical comic American Splendor in 1976 in collaboration with Robert Crumb. Subsequently working with a variety of artists, Pekar mined the drama and comedy of everyday life. His dedication to a poetics of commonplace realism was tempered with neurotic introspection, jazzy rhythms, and the immediacy of stand-up comedy. (A good introduction, general overview, and prelude to the evening can be found at the online obituary by UCL's Ernesto Priego, who will speak at the event). Fans, artists/ and cholars will talk briefly about their favourite Pekar pages/moments/stories. Joining Ernesto will be the artists and scholars Sarah Lightman and Sina Shamsavari. Master of Ceremonies is Paul Gravett (journalist/broadcaster, curator of Comica at the ICA). Following the screening attendees will reconvene for a celebratory wake at the Institute of Education bar. An illustrated essay that Pekar and Cleveland cartoonist TaraSeibel wrote together and Seibel drew will appear in the catalogue for the exhibition "Graphic Details: Confessional Comics by Jewish Women," which opens 1st October at the Cartoon Art Museum in San Francisco. It may be the last comic that Pekar helped write before he died, but the New York Times reports it is just one of several works that will be released in the months to come. The biggest science fiction comic strip in the French language world is not, as you might think, Barbarella but rather a series called Valerian and Laureline. Running for over 40 years it has reached a total of more than 20 albums, all written by Pierre Christin with art by Jean-Claude Mezieres. The books tell the stories of two time/space agents, the 28th century born Valerian and his female companion Laureline who comes from the Middle Ages, and with both spacecraft and time machines available to them, the series has the same potential as Doctor Who for a vast range of settings. The City Of Shifting Waters is the first book in the French series. 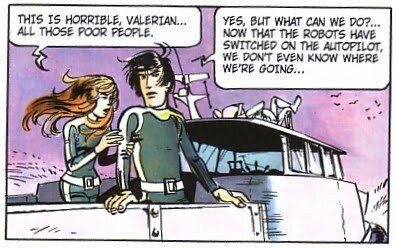 Valerian and Laureline are spatio-temporal agents of Galaxity, the Earth of the 28th century, who are dispatched back to 1986 to recapture Galaxity’s only political prisoner, Xombul, who has escaped and travelled back to just after a devastating nuclear accident changed the planet into a flooded world. Valerian goes undercover in a flooded New York with hippy thieves who take what they can get from the upper, dry, stories of the skyscrapers as well as using scuba gear to target bank vaults. With them he discovers robots taking scientific secrets and traces them back to Xombul who effectively kidnaps Valerian and Laureline to his lair in the Rocky Mountains from which he plans to take over the world. The Valerian and Laureline books have had sporadic English language releases before with the only UK publications being four books published by Hodder-Dargaud in the mid-1980s. While this story originally began in Pilote magazine in July 1968, this is the first time that this particular album has been published in English. The original story was split over two runs in Pilote, the first from July to October 1968 while the second ran from April to July 1969, and it does show in the book with the first half set in the partially submerged New York before our heroes literally sail off into the sunset and the second half of the story which is set in the Rocky Mountains. If anything Christin's plot point of a flooded Earth is more relevant now than it was in 1968, albeit rather more familiar now to us through CGI effects in disaster films than it would have been to cinema audiences 40 years ago. Yet the story does reveal its age with the main protagonists in the city being hippies rather than the Mad Max-esque characters that they might be portrayed as today, while Laureline's frequent outbursts on women's liberation feel equally dated. Despite the time travel element, this is a simple story with few characters that moves along to its expected conclusion. Yet the biggest problem for me is Mezieres artwork. In itself it is good with the partially submerged cityscapes in the first half and a decent representation of a heli-plane based on the Canadair CL-84 amongst other things in the second, but his style doesn't seem to fit with the story as this is an adventure story with humour artwork. Valerian and Laureline themselves are bland, with out of proportion heads, making them look rather like Terrahawks puppets, while the rest of the characters wouldn't look out of place in the pages of Mad magazine, with Xombul's mad scientist, Mr Schroeder, apparently based on Jerry Lewis’ The Nutty Professor. For a tongue-in-cheek series like Clifton this would work but, for me, it looks out of place in what is basically a straight good versus evil adventure story. Which is a pity since, with the conclusion of The Chimpanzee Complex and the Aldebaran/Betelgeuse cycle, Cinebook is in need of a new mature science fiction series to add to their schedule and unfortunately Valerian and Laureline is not it – not yet, anyway. Valerian and Laureline - The City of Shifting Waters will be of interest to younger readers but adults will probably not find it satisfying enough either story-wise or art-wise. Since the series has lasted for so long in France, I can only assume that it gets better than this. 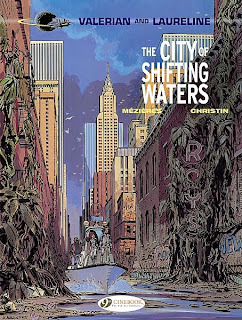 • There are more details of The City of Shifting Waters on the Cinebook website. • There are more details of the Valerian and Laureline books on by Jean-Claude Mezieres’ website (in French). 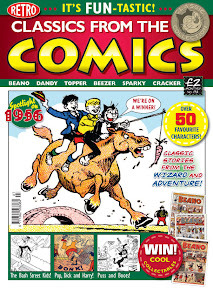 There's the usual great mix of strips from a variety of DC Thomson humour comics in the latest issue of Classics from the Comics, on sale in all good newsagents now. Favourites this time around have to be a 1977 episode of Spoofer McGraw, a teller of tall tales who regularly befuddled his duffel-coated mate in Sparky, sometimes, I recall in response to readers letters. Sparky was always one of my favourite DCT titles (although I was never very keen on Puss and Boots, who also feature this issue) and as Spoofer comes up with an absurd explanation for the arrival of a large cement mixer on his street, it's hard not to see why. Humour is always in the eye of the beholder but there's plenty of fun to be had this issue, with two simple but effective 'sight gag' strips starring Mickey the Monkey from Topper; Little Plum taking up weightlifting, only to discover it's not all it's cracked up to be; a brilliant 21-frame Desperate Dan page by Dudley D. Watkins (21 frames! How often do you get that on one page today?) from 1956; a really bizarre Pansy Potter as she takes on, and betters, a weird-looking spiv character selling springs (springs? why?! ); and a great Figaro! strip from 1962, from Topper, that pretty much rounds the whole jam-packed issue off. There are also a couple of adventure strips - Space Kids by Ron Smith from Beezer, General Jumbo from Buddy, and older material too, from Adventure and the origial Wizard (although I'm not so sure these text stories are as good as the selected comic strips. They sit a bit uneasily with the rest of the comic, I think). Once again, it's a fine mix and there's plenty for fans of The Beano and sadly now long-gone DCT comics to enjoy. I do hope though, that we'll see a return of creator credits, which was beginning to creep into the title but seems to have been dropped this time around. Other than that, £2 well spent, in my view! 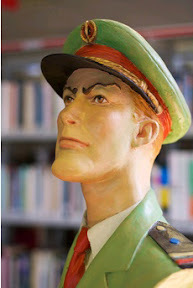 (with thanks to Lizzie Bennett, last updated 28/7/10): Variety, Dark Horizons and other web sites are reporting this morning that Warner Bros. Pictures has closed the deal for its film version of Dan Dare starring Sam Worthington (Avatar, Clash of the Titans). The new film will reportedly be based on the Garth Ennis-Gary Erskine mini-series published by Virgin rather than the original and much-loved original 1950s series from Eagle. Given the Warner Bros. involvement, downthetubes wondered if a new Dan Dare comic may be on the cards, perhaps produced by DC Comics, but the Dan Dare Corporation tell us: "DC comics have absolutely nothing to do with the Eagle or Dan Dare or any deal." Rumours of this latest attempt to bring Dan Dare to the big screen first surfaced back in March, but the Dan Dare Corporation has been trying to get a movie version of the 1950s Eagle hero going for a number of years. While Dan Dare has never been a popular character in the US his adventures were widely republished in Europe and Australia. 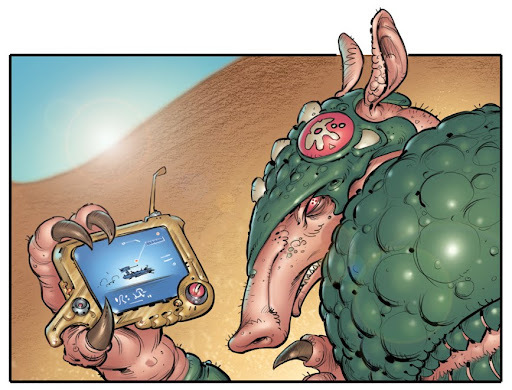 New adventures of the original Dan Dare feature in the comic magazine Spaceship Away, while the latest revamp - there have been several - was published by Virgin, written by Garth Ennis and drawn by Gary Erskine. It is reported that the new film will be based on this version, which attracted its own fans but did not sell huge numbers. Worthington (who recently announced a deal with Radical Publishing under which his Full Clip Productions will create content for comics and films) has been attached to the project. It will be produced by Basil Iwanyk, who also produced Clash of the Titans and will team again with Worthington on Clash of the Titans 2. Dan Dare Corporation owner Colin Frewin is attached to executive produce the film, along with Dan Lin. (Frewin oversaw the enjoyable 22-episode animated version of Dan Dare: Pilot of the Future released in 2002. Variety reports the Warner executives attached are Sarah Schechter, Ollie Madden and Matt Milam. Labels: Dan Dare, Dan Dare Corporation, Film News, Sam Worthington, Warner Bros.
downthetubes: Let's start with your recent work on 2000AD's Damnation Station. How did you come on board with that project? Boo Cook: There often comes that scary moment as a freelance comics creator when your current crop of jobs is about to run out, so you tentatively put the feelers out to your various sources hoping that there'll be something lurking to keep that old roof up there. I asked my longest standing 'source', Matt Smith, aka Tharg the Mighty, if he had anything floating about that I could work on; preferably in the 'gritty, realistic, sci-fi written by Al Ewing category'. Wouldn't you know, that's exactly what was available and I got offered episode five of Damnation Station. The script immediately sang to my old skool sci-fi sensibilities: big bleak moonscapes, detailed space suits, wrecked spacecrafts and tangible characters. I really jumped in with both feet, and whether Matt detected my enthusiasm, or he just had three more episodes without an artist attached lying around I don't know, but I was handed the next three-part story arc shortly after completing part five. 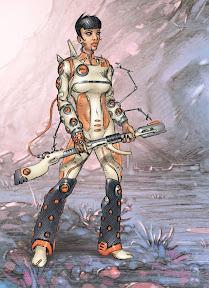 It was a refreshing change to go from working on something like Anderson: Psi with its 20-odd years of canon set in stone, to something where I got to design fresh characters, outfits, guns, ships etc, not yet drawn by hundreds of artists. downthetubes: You were picking up from artist Simon Davis, right? How much were you working from his designs and how much of the design work were you doing yourself? Boo: Simon had the task of introducing the bulk of the cast with his initial four-episode arc, so I was sent jpegs of the main characters to work from. This was a little tricky in as much as all Si's people are incredibly life-like and emotionally articulate. I don't know if he works directly from photos of models or just has an incredibly inventive brain, but without either of those I had to kinda start by copying the faces from the few jpegs I had, and evolving them from there. It's not like Dredd, for example where he is 90 per cent uniform that you can copy and build on. These were very real, human characters. In an effort to keep up with the realism of Si's work I used a lot more photo reference for my figure posing than I usually do, but then I would have to try and morph a photo of me into an overweight middle-aged black guy, for example. Incidentally, the character Joe Nowhere is someone I didn't get quite right to begin with. There were less reference pictures of him and the strip hadn't started in the Prog at the time when I was working in my run. I just had him pegged as an average build/age kinda guy with no hair and a goatee. It wasn't until I'd drawn him a few times that I twigged he was meant to be considerably older and considerably less fit and healthy, so I tweaked him gradually as I went on. The episode that my run on the strip began with was the introduction of a new character, so I designed him. He was meant to be loosely based on Roy from Bladerunner, who is one of my all time favourite sci-fi characters. He ended up looking kinda like Mr. Hudson for all you Ndubz fans... I am not among youuuuu! He was in a space suit that hadn't been mentioned previously, with a gun that hadn't appeared in Si's run, and a ship that had only been vaguely depicted so far, so I really went to town on that lot straight away, hoping that where my art style differed from Si's in a realistic people way, I could ramp up the 'sci-fi', which I love to do. Also, I like to try a fresh approach with each bulk of work in order to keep me on my toes artistically. As soon as I start relying on the formulas of a particular style or method of working, my brain slowly starts to switch off and rely on tested techniques rather than progressing and thinking things through meticulously at each stage. With this in mind I asked writer Al Ewing if he had any ideas about how I should approach the strip. I think he said that I should definitely go for painted backgrounds and inked figures in the foreground. It was an approach I hadn't tried before, so I was happy to dive in and accept the challenge. Already though, by the end of my fourth episode, which all happens in a relatively similar environment, I could feel myself starting to rest on my artistic laurels once more, so the next work I do will probably be in acrylic paints. Si gave me some great characters to work with and in particular I loved drawing the seriously twisted 'Host' alien, but Al also gave me plenty of other stuff to design in the final three episodes of my run: more aliens, more craft, and more ways to explode! downthetubes: You mentioned Al Ewing, the writer of Damnation Station. His work on his own strips and on Dredd seems to have really caught the imagination of the 2000AD readership. Why do you think that is? Not for nothing did I vote for Al as 'best writer' in the Eagle Awards. It was no sudden rush of 2000AD jobs for Al, and I think that was maybe even a conscious effort by Matt Smith to help hone Al's full-on mentalism into a grounded and fully-fledged writing brain, which definitely seems to have happened. Al can make me laugh out loud reading the Prog, which is a very rare thing. But he can also write very believable and emotionally realistic, slow burning characters as is apparent from Damnation Station. 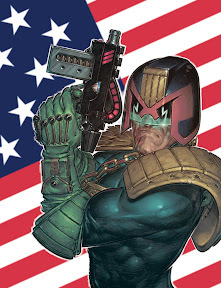 As for his work on Dredd, it's clear that Al has an encyclopaedic knowledge of Dredd's back story and universe, which, when combined with his genuinely hilarious sense of humour, solid characters and infinite idea stream, makes him second only to Wagner in that arena. Boo: Three years ago I wrote to writer, editor and letterer Rich Starkings to ask if I could work on his monthly Elephantmen comic because, basically, I love it - simple as that. Having been raised on 2000AD for nearly 30 years, the comic instantly caught my eye when it came out around eight years ago because of it's similarity to the classic AD strips of old - there's slices of Rogue Trooper in there, Meltdown Man, Halo Jones - just the very vibe of the art and writing oozed 2000AD so it was a no-brainer for me to get. 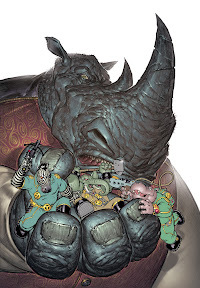 The Elephantmen comic stems from the wider universe of Starkings' Hip Flask Mystery City books with uber artist Jose Ladronn, and is a mixture of many genres, largely the sci-fi realms of Bladerunner. The story follows human/animal genetic hybrid protagonists, the Elephantmen, bred for war, and now trying to reintegrate into a society that shuns them. As well as some well rounded, very human characters there's some serious philosophical, metaphysical, ethical and ecological issues in there to wrestle with while yer eyes pop out at the lush myriad of artists involved, one of whom was Henry Flint. It was Henry's issue that really fired me up and compelled me to write my 'I love Elephantmen!' email to Richard. Since then I've been regular cover artist on the book, did interiors for issue 21, (subtly titled 'KILL!KILL!KILL!' ), and I'm just commencing work on volume 2 of the prequel/offshoot 'War Toys - Enemy Species'. downthetubes: What next for Boo Cook, comics wise and otherwise? Well, I'm currently working on a two-issue follow up to the gritty Elephantmen prequel, 'Wartoys'. It's called Wartoys: Enemy Species and again it sees me working in a new experimental way. I'm doing ultra expressive 'dirty' penciling, with a sort of Charley's War meets sci-fi edge, and Gregory Wright, the top notch Elephantmen colourist will be applying greyscale tones to it in Photoshop, so it will be in monochrome like the first series. I'm about 10 pages in and so far I'm having some of the best fun I've ever had drawing comics! Aside from that, I am of course always up for doing anything that Tharg will throw my way, and in fact he's recently commissioned me to draw more Anderson. There are also a few things I'm working on off my own back. Firstly a sci-fi comic product named 'BLUNT', about a Neanderthal-gened terraformer who has a penchant for making moonshine... a fledgling colony of planet pioneers, over-reliant on technology have to turn to him for help when their planet's evolution goes haywire! It's scripted by novelist Tom Eglington [author of the children's novel Spellbound Hotel - Ed], a close friend, and it's something we've been knocking into shape for a while, with a view to pitching very soon. Some concept pics are on my blog. Finally, future wise: playing drums, there'll be lots more of that. 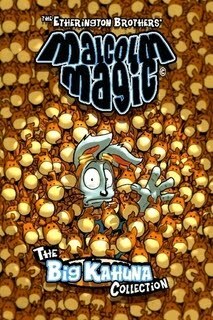 downthetubes: One last question, what's on your reading list at the moment, in terms of comics? Boo: My comics reading has peaks and troughs in terms of amount and content. I used to read a lot more Marvel/superhero stuff a few years ago, but that has almost trailed off to zero. You get the odd, mind-blowing good run, such as Greg Rucka and J.H.Williams III's recent stint on Detective Comics/Batwoman, which was an incredible read, and show's there's still much to be done in the genre. Obviously, I love Elephantmen, but I've probably said enough about that. I love Kirkman and Adlard's Walking Dead -- character-driven comics don't get much better than that! I'm also having a massive flirt with old school fantasy in the form of Conan, which I've been ploughing through with the Savage Sword reprint volumes as well as the new monthly. I love pretty much everything Jack Kirby ever produced - my favourite run of comics ever being his take on 2001: A Space Odyssey - in both his ten-part re-visioning and his massive treasury edition direct adaptation, which, to me, is the Bible. But as far as new artists go, I'd say Elephantmen's Marian Churchland is producing some beautiful work right now. At the opposite end of the style scale, I'm a massive fan of the frenetically bombastic Nick Dyer's work on Dredd etc. for 2000AD. To be honest, there's really too much to mention as far as my favourite comics and creators go, but that's definitely a pretty representative core sample of my current likes! downthetubes: Boo, thanks very much for your time, and best of luck with all your projects. • And, seriously, check out Elephantmen (www.hipflask.com) It's amazing!